It’s not a “word,” but it perfectly describes Chipotle Chili Tacos. They are spicy, tangy, smokey, fragrant…yu-um. I found the inspiration for this recipe during my Weight Watchers online days. When I’m dieting and dealing with smaller/leaner portions, boosting flavor is my key to feeling satisfied. Chipotle Chili Tacos are a quick meal to prepare and “Baseball Mom” approved. Just go for the soft tortillas and wrap it all burrito style. Then wrap the burrito in foil. In a large skillet, heat chili powder and cumin over medium heat for one minute. Push seasonings to one side of pan and place olive oil on the other. Add onion and garlic to the olive oil and saute for 3 minutes. Add ground beef to pan and stir to combine seasonings, onions and garlic with meat. Cook until beef is cooked through. Stir in tomato sauce, chipotle pepper and beans. Reduce heat and simmer for another 5 minutes. 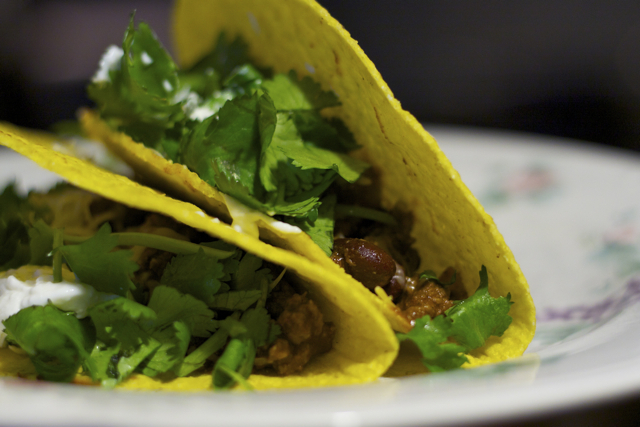 Serve the meat mixture in taco shells with a little sour cream, cheese and fresh cilantro. Tapatio or your favorite hot sauce is optional.